Lord March’s Goodwood Revival comes but once a year, and the list of stuff you need to pack for it reads almost as long as the list of legendary drivers who now attend the world famous vintage racing festival. In order not to stick out like a 21st Century sore thumb, appropriate attire is essential; after all, no self-respecting Goodwood-goer would be complete without either something in tweed or a period military uniform. For ladies, vintage dresses are the order of the day. What that means of course is that you effectively have to pack twice: once so as you don’t look like someone who hasn’t been out the house since they stopped rationing, and can therefore not get stared at in the pub in the evening when you’re hungry and tired after a day’s multi-million pound car spotting – and once so you do, otherwise you can’t fully indulge yourself in all things vintage at the West Sussex circuit and truly enter into the spirit of the event. Jeans you see aren’t allowed in the paddock. Effectively, you need two of everything; one for your modern-day self and one for Goodwood. That means you’ll need a car with a very big boot to carry it all in – quite how people “do” the Revival in an MGB is beyond me. Okay, so I lied about the sink, but if you were to flick the switches situated just inside the estate’s more angularly-styled rear hatch that allow the rear seats to fold forward, and you were to adopt a 1950’s approach to your morning shower routine, you could easily find yourself questioning the need for overnight accommodation. The double-layer boot floor means you’d still have space to store your toothbrush and it also helps keep the load-space very nearly flat. Quite simply the Octavia’s boot is cavernous. There are roof-rails as standard too, just in case you need to carry yet more of life’s paraphernalia. 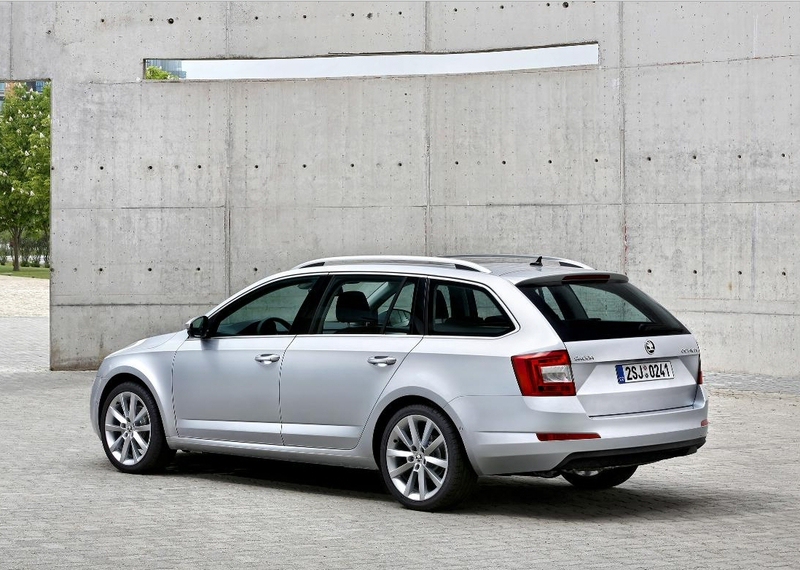 Of course the Octavia estate’s talents don’t just extend to lugging loads. If fitted with the 105bhp 1.6 diesel engine (as tested, and probably the pick of the bunch), not only will your Octavia allow you the opportunity to avoid having to pay any road tax, it comes with the promise of up to 74.3mpg too. Frugal the Octavia may be, but don’t think Skoda have scrimped when it comes to fixtures and fittings. The SE spec car that whisked me across the South Downs kept me cool with dual-zone air con and safe with seven airbags, entertained with a digital radio, informed of traffic congestion thanks to sat-nav, and connected to friends and family via Bluetooth – which incidentally was, in my car at least, voice activated. The Octavia’s also very comfy. It’s slightly longer and wider than it once was, and now sits on VW’s innovative MQB platform. That means that it rides with new found comfort and handles better than ever. Granted, a diesel estate of any variety is not going offer the most exciting of driving experiences, but thanks to some nicely weighted controls, a logically laid out interior and further acres of room for both front and rear passengers the Octavia Estate proves to be a relaxing place to be when it comes to munching the miles. Switchgear and soft touch materials that will be recognisable to anyone who’s sat inside the new Golf, Leon, or even the odd Audi or two help create the impression that everything’s also been built to go the distance. 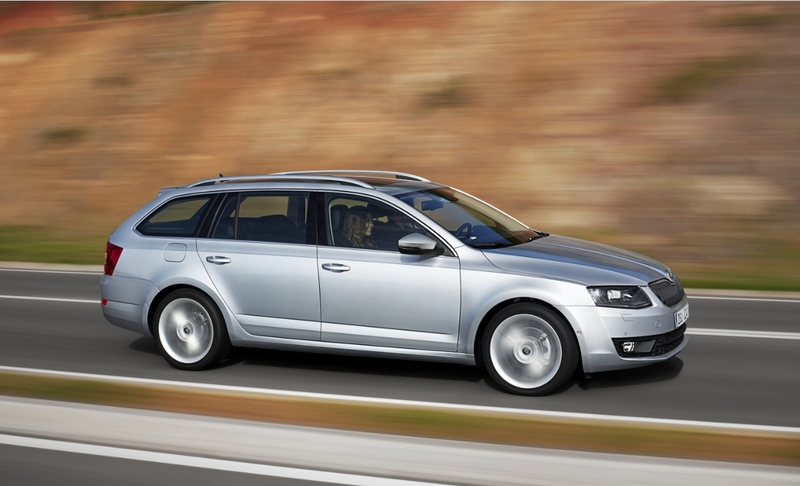 Because of its mix of comfort, economy and space, the Octavia Estate is both pleasing to own and pleasing to travel in. Like its predecessors, it’s going to be a firm family favourite – and who knows, should you find yourself just north of Chichester come next September, it may even help out with a day or two’s time travel, too!